1. What is a good way to create a linux pc exactly how you want it, create a ghost image of it, and mass produce CDs that can be used as auto-installers? 1a. These images might possibly need to format windoze PCs and install the image created? 2. I saw an open-source ghost alternative - FOG. Has anyone used it? I assume you want to be able to make this like a recovery CD that can be sent out into the field and the job be performed by anyone right? Should I also assume you don't have high bandwidth network connectivity back to a central location? Initially I thought custom kickstart installation CD but there are several ways you could do this. If it were me I might just take the target system and strip it down to bare minimum, remove all unnecessary software. Then boot from alternate media, shrink the file system and partition down to a minimal size and then dd the partition off into an *.img file. I would create a custom Live CD that was stripped down and contained the disk image and would fire up a menu when booted which would allow the user to format the target system and restore the disk image. It wouldn't take much of a script tied to a menu option to format and partition the disk, restore the image (using dd), resize2fs the file system and install grub. The script could also mount the file system and customize a few things (host file, /etc/sysconfig/network, etc). You could get rid of X altogether and make a simple text/curses based menu come up on initial boot which would make it a little faster and more targeted to the specific task. It would be much like any other recovery CD at that point. yes, that is pretty much exactly what I want to do. Once I build a main image, I have to make it so I can give to a field tech and he can pop it in and watch it convert from ntfs to ext3!! 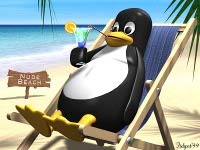 it pretty much has to be fool-proof so that is the key to my continued success here as I pretty much have the whole team convinced that linux is the way to go...which has the IT director here in a fit because he lives & breathes M$. Let me paint the M$ picture here - they have one .net developer and they use visual source safe...? Huh? Good luck to you. I would probably work on that for you this weekend just for fun but I'm heading up to Chicago tomorrow with the wife and boy. Looking for something to do, might go to the Cubs game (there are a few tickets available on stubhub), then over to Grant Park for a Taste of Chicago and then fireworks. I have a reservation in South Bend so we'll head there after the fireworks and then up to Michigan on Saturday morning for the Red Bud national MX race (the second moto will be live on NBC Saturday afternoon). Sounds like a very fun project you are working on though! Chi-town sounds fun. Your help might be requested as we get further down the project. The prototype is up and running now and we are doing benchmarks on it now. I talked to a guy that had a mandrake system built for Heathrow in London (I think?) for two years without any reboots or problems. That was my motivation as we constantly have to tell clients to power off the system and power it back on. It is now getting to the point where if a system keeps failing, my boss is asking how hard would it be to replace it with the linux system. when I ssh into the box as demo, I am on demo pts/0. Is there a way to send commands to the :0 session? For example, the 'firefox -remote openURL() command only works when you run it in the terminal on the logged in session, not the pts/0 session. There might be times that I need to restart firefox and I would like to do it via ssh rather then using VNC. Is there a way? Another idea would be to watch /var/log/httpd/access_log which gives me a live log on the show playing...if this does not play, I would/could restart firefox if need be? [demo@kiosk ~]$ firefox -remote "openURL(http://blahblahblah/)"
Of course you could also set up a script to watch that log and do this automatically like you mention. Also, instead of using xhost to grant X access to an entire machine (or to everyone) you can grant X access to a specific user using "xauth". Not sure what your remote security concerns are on these devices. it is going to be pretty secure. The goal is to only allow port 22 or a custom port for SSH between the control server and the players. We would get into the control server in order to get into the players, but gaining complete control of the logged in desktop has been a challenge. If you want to gain complete control of the logged in desktop why don't you just VNC into it? You know VNC server is built in and all you have to do is check a checkbox to remote control a desktop right (System->Preferences->Remote Desktop)? we have that for remote controling the desktop, but using CLI would be better(if possible). The xhost stuff you sent me helped alot (Thanks) but if we could do things through SSH, it would be better. VNC slows down the show when you are remoted in (small side effect and not a deal breaker) so one example would be to be able to kill firefox, and restart it with the settings that the demo user's firefox profile use. I have a file called 'createxml' in /home/demo/bin with 755 permissions and demo:demo as the owner:group. in my php file, located in /home/demo/www called updatedb.php. How is updatedb.php executed? If it is executed via the web server through the browser then it will be executed under user "apache". The file that you are trying to write to (playlist.xml) needs to also be writable by user apache in this case. I assume your "createxml" is executed by your demo user via cron or manually when logged on as that user but if it is updatedb.php is executed through apache then it will be user apache trying to write to the file. In addition to giving write permission to apache on that file you also have to make sure the apache user has at least execute permission on every directory below that file. You're a star!! Thanks...apache did not have write permissions to that file! THe player and the control server are playing pretty nicely together, but I still need a CD image to wipe 90 winxp machines out of their misery!! you up for some possible consulting work? Always. What's the timeframe? I'm heading up North after work today for a charity golf tournament tomorrow and will be spending the weekend with the relatives but other than that I should be available to help out.